Twenty-five years ago at Boston’s Isabella Stewart Gardner Museum, two men posing as police officers tricked Rick Abath — the night watchman — into letting them in. 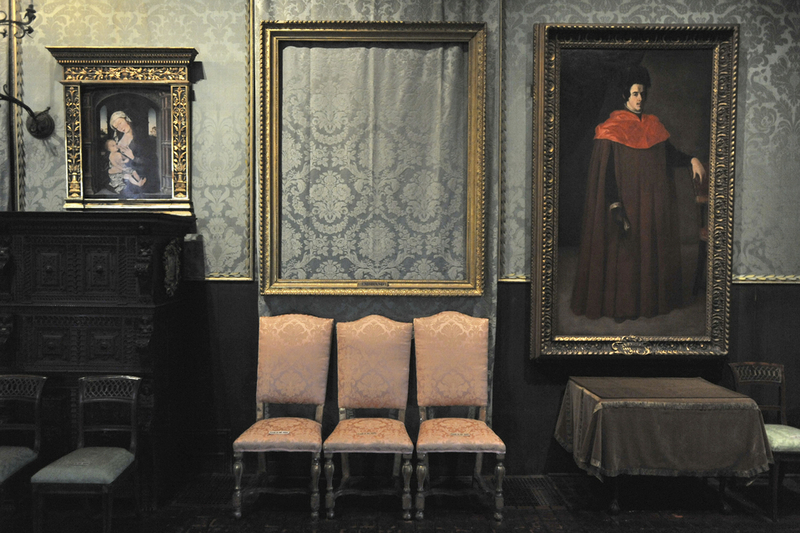 The two men ended up stealing 13 objects worth half a billion dollars, including three Rembrandts, a Vermeer, a Manet, and a bunch of sketches by Degas. They have never been caught, nor has the art ever been recovered. This is how police found Rick Abath after the theft. The former night watchman will never forget the night he was tricked into letting two thieves into Boston’s Isabella Stewart Gardner Museum. He worries others won’t forget it either. The thieves duct-taped around Abath and his partner’s eyes, and they duct-taped the bottom of his chin to the top of his head. I found myself in Brooklyn, 200 miles from the scene of the crime, tracking yet another lead. My guide had phoned me suggesting he knew something of the robbery, and he had some street credibility because he was allied with a known two-time Rembrandt thief. He took me into a storage locker and flashed his light on the painting, specifically at the master’s signature, on the bottom right of the work, where it should have been, and abruptly ushered me out. The entire visit had taken all of two minutes. Call me Inspector Clouseau — I’ve been called worse in this matter, including a “criminal accomplice” by a noted Harvard law professor — but I felt certain I was feet from the real thing, that the Rembrandt, and perhaps all the stolen art, would soon be home. I wrote a front-page article about the furtive unveiling for The Herald — with a headline that bellowed “We’ve Seen It!” — and stood by for the happy ending. It never came. Negotiations between investigators and the supposed art-nappers crumbled amid dislike and suspicion. Gardner officials did not dismiss my “viewing” out of hand, but the federal agents in charge back then portrayed me as a dupe. Eighteen years later, I still wonder whether what I saw that night was a masterpiece or a masterly effort to con an eager reporter. Stephen Kurkjian, Master Thieves: The Boston Gangsters Who Pulled Off the World’s Greatest Art Heist (PublicAffairs 2015). Anthony M. Amore & Tom Mashberg, Stealing Rembrandts: The Untold Stories of Notorious Art Heists (Palgrave Macmillan Trade, Reprint edition ed. 2012). Morning Edition, Former Security Guard Reflects On What He Lost One Fateful Night, NPR.org. Malcolm Gay, For Gardner Museum Director, Art Heist Set off 25-Year Odyssey of False Leads and Loss – The Boston Globe, BostonGlobe.com. Stephen Kurkjian, Does a Connecticut Shed Hold the Secrets of the Gardner Heist? – The Boston Globe, BostonGlobe.com. Tom Mashberg, Isabella Stewart Gardner Heist: 25 Years of Theories, The N.Y. Times, Feb. 26, 2015. The Editorial Board March, FBI Should Open Files on Gardner Heist – The Boston Globe, BostonGlobe.com.